In a nutshell - you are now reading the 2nd edition of the Netguru Fintech Barometer. The idea is that, each quarter, we scramble through all earning call and conference transcripts to check the pulse of the fintech industry. The first Fintech Barometer, including insights from C-level executives of HSBC, ING and Barclays, was published at the end of Q1. This time I dove into publications from April to the end of June 2018. As previously, I used SeekingAlpha. 39 transcripts met the condition of containing any meaningful reference to the fintech industry. What is a meaningful reference, you ask? For instance, the discovery that Oliver Samwer, CEO at Rocket Internet, sees fintech as one of the spaces on which they will bet their money. But there were more than that. Below are my top picks. In short, he suggested not to follow the Chinese path, meaning that the most disruptive thing for incumbent players might be giving any initial regulatory advantage to fintechs. I think if it's a threat, it would come from the regulatory perspective - the willingness of regulators to allow, in my words, an un-level playing field or an advantage to exist around fintechs. Again, what we've said is we'll welcome anybody to the industry, just come and compete on the same rules and standards that we're held to. We have seen in a couple of places in the world, China is an example, where at least an initial advantage was given to some of the fintech companies, and I think that proved quite disruptive to the existing financial institutions. I don't see that. And I think our regulators here have been pretty outspoken around a lack of willingness or desire or intent to do that. But if that were to happen, that would, in my mind, be the single most disruptive thing. Disruption was also mentioned on different occasions. 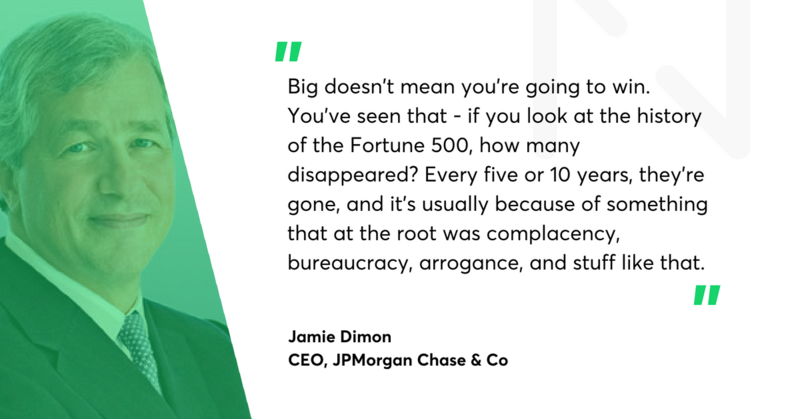 Hear this warning coming from Jamie Dimon, CEO at JPMorgan Chase & Co.
During a conference, Dimon was asked if large banks developing their own technology and mobile apps have an advantage over small banks partnering up with fintech. Being big could be an advantage. I mean, basically big, you have the money, but if it’s offset by complacency, bureaucracy and stupidity, you’re going to lose. Big doesn’t mean you’re going to win. You’ve seen that - if you look at the history of the Fortune 500, how many disappeared? Every five or 10 years, they’re gone, and it’s usually because of something that at the root was complacency, bureaucracy, arrogance, and stuff like that. So yes, it’s an advantage, but it’s not like oh God, we’re big, and we have this huge advantage. We’ve got to build the better systems every day and every month. Otherwise the competitor will come over, and you see that happening in lots of other businesses today. If you’re still a believer in “too big to fail”, see the next quote from Mastercard. Throughout this banks-versus-fintechs game, some companies gain regardless of which side has the advantage. One of them is Mastercard, which plays with both banks and many fintech leaders (e.g. 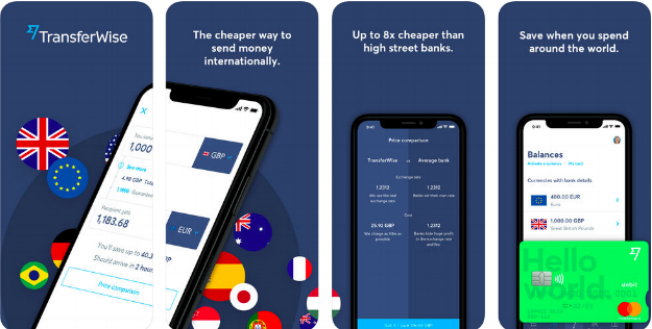 Revolut or Starling Bank). And it’s perfectly clear to Mastercard’s CEO Ajay Banga that becoming commoditized it is a real threat for banks. 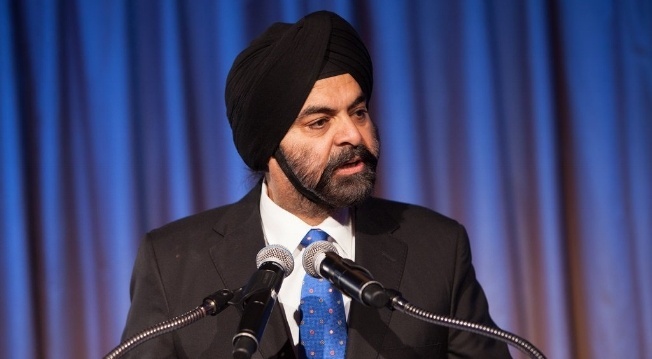 Mastercard's CEOAjay Banga foresess "an interesting fight between the fintech players and digital players and the banks"
(...) I think PSD2 is really interesting, because what they are trying to do is to make a lot of competitive energy come to the front end of dealing with a consumer, and then maybe the banks become the backstop of providing all the service. But that’s not a good place for the bank, because that’s very soon going to become commoditized by the margin. So a lot of the good banks are also figuring out a way to compete with the front end and I think that will only accelerate a change and I think it will be an interesting fight between the fintech players and digital players and the banks as the next few years go by at PSD2. Whenever there’s a fight, it’s best to keep up the with the scoring. 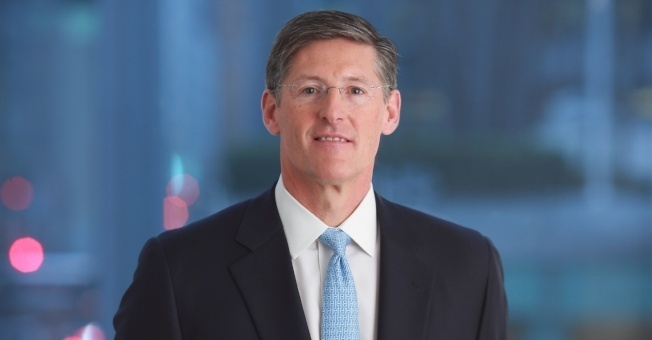 So here’s Dean Athanasia, President, Consumer & Small Business at Bank of America Corporation (BAC), talking about the innovative stuff BAC has rolled out in the last 18 months (e.g. cardless ATMs, advanced centers without human employees and so on). First, Dean was clear about this bold BAC strategy of having it all - client borrowing, investing, savings, transacting - in one app. Then he presented data showing how BAC could leverage their existing customer base. Does it make sense? I think it does. Dean also shared some numbers, the most interesting part I found was about Zelle. Zelle is a US-based digital payments network built by a consortium of American banks to compete with PayPal and fintechs. Zelle so far delivered 28.6 million payments (sent or received in total). 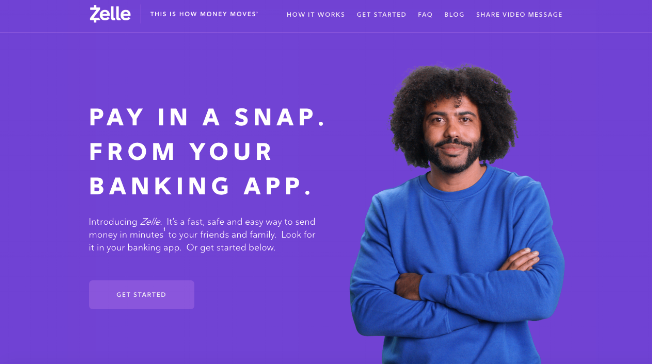 “We are already twice the size of Venmo (...) And then we’re at 25% of Zelle out of 100 banks. We are 25% of the volume of Zelle. So, we are driving it forward (...) working with all the other banks to move that forward” - added Dean. ABN Amro Group's CEO Kees van Dijkhuizen shared insights on digital innovation and some record numbers in their digital apps and tools (Tikkie and Grip). Moving to Grip, this is our tool for clients to analyze personal spending, which was co-developed with a fintech. With 450,000 users, we have the largest user base in the Netherlands. Usually, we focus on the impact of fintech on onboarding, customer experience or margins. So I was amused to find this quote from ProSiebenSat.1 Media's CEO Conrad Albert. The hypothesis here is that fintech is pushing incumbent players to spend more heavily on TV advertising. The TV ad spend in Q1 in the finance segment is significant - was 31.7%, up above total media expense growth (...) traditional finance service companies apparently need to accelerate their customer value creation in order to avoid losing customers to new startup fintech firms. And therefore, they need to do image campaigns, and there is no better medium for that than television, of course. In fact, fintech companies rarely do traditional advertising, they mostly rely on the word-of-mouth and digital marketing. One of the exceptions is this Habito TV 30 seconds spot. Fintech is becoming a major pillar of our business. And at a very rapid speed, the company is driving the growth of our company. These are the words of Masayuki Hosaka, vice chairman at Rakuten, the Japanese e-commerce giant that is trying to transform the insurance industry and itself. In Q1 2018, that transition translated into 14% higher consolidated revenue year-on-year. Fintech business drove this growth. In the other segment, Fintech delivered triple-digit year-on-year revenue growth, mainly driven by fast-growing off-line commercial transaction fees collected from merchants as well as cash withdrawal fees collected from consumers to cover bank handling charges. And finally, Wirecard AG's CFO Alexander von Knoop. Wirecard, the Germany-based card infrastructure provider, powered the rapid growth of many fintech startups like Monzo, Loot or Monese. This year, Wirecard has been chosen by Transferwise as a debit card issuer and, almost simultaneously, ditched by Revolut. Alexander von Knoop, Chief Financial Officer, shared some fintech-related business numbers. They calculated that impact of fintech was €60 million EBITDA effect, which was 6 times higher than in 2016. We have a small, but heavily increasing business with fintechs. I think, it’s always good to have a link. 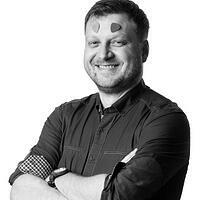 (...) We like the spirit of startups in fintech. And in the last two years especially, a lot of fintechs came on the platform. (...) We also already have a quite successful small lending business with such fintechs that related to about €240 million and €60 million EBITDA effect in 2017. In 2016, this number was at €180 and €10 million EBITDA effect. So I think, it’s a small part of our business. But we get a lot of, how shall I say it, additional impulses. And on the other side, of course, it strengthens our value chain in the area of digital services. So I think it’s a real win-win.